Henrietta Howland Robinson learned everything she needed to know about financial matters from her grandfather and father. She took to heart her dad’s advice to “never owe anyone anything, not even a kindness,” which didn’t endear her to very many people. But when cities and banks are turning to you for a bail out, it doesn’t really matter what other people think. Green was born into a Quaker family from New Bedford, Massachusetts. She was the only heir to a fortune made from whaling. Her mom was sick a lot, so Green lived with her grandparents for most of her childhood. Her grandfather’s eyes were bad, so she read the financial news to him, and by the time she was fifteen years old, she knew more about stocks and bonds than most men in the business. She opened her first savings account when she was eight, depositing the $1.50 she received for a weekly allowance in it. Her first business responsibility was to keep strict accounting of personal and household expenses, a practice that served her well in the future. Green’s formal education was spotty. She was sent to a Quaker girls’ school on Cape Cod at eleven years old, where she learned frugality. Whatever the students didn’t eat at the previous meal, they had to eat at the next. The school directors impressed upon the privileged students that if the rich girls didn’t learn how to economize there wouldn’t be any money left to educate the poor girls. At 16 she attended the Friends’ Academy in New Bedford for a year, but she missed the spring semester because she got sick. To learn the social graces, she went to finishing school in Boston for a little while. Green was considered attractive and enjoyed going to balls and parties. One season her dad gave her $1200 for clothes. Green spent $200 and put the rest in savings. In 1861 Green moved with her father to New York. It was there that she met Edward Henry Green of Bellows Falls, Vermont, an occasional business associate of her dad. Six months later they were engaged. Edward was 14 years older than Green, an easy going Episcopalian who enjoyed the finer things in life. He had his own wealth, and the only thing Edward and Green had in common was a love for money. Green was 30 years old when they married in 1867, and shortly after the wedding the couple moved to London. When her father died, Green inherited five million dollars which generated several thousand dollars a week in interest. She invested in U.S. bonds, railroad bonds, and real estate. The largest amount of money she made in one day was $200,000. During the post-Civil War railroad expansion, railroad bonds flooded the market causing three banks to fail in 1872. During the following year over 11,000 companies went bankrupt and the New York Stock Exchange closed for ten days. In this environment, the Greens wanted to be closer to their investments, so they returned to the States settling in Edward’s hometown in Vermont. They brought with them a son, Edward Howland Robinson Green (known as Ned), and a daughter, Hetty Sylvia Ann Howland Green, who went by Sylvia. MAKING MONEY, NOT FRIENDS Green didn’t fit in too well with her husband’s people. She butted heads with Mary, the housekeeper, claiming that she was wasteful, and she did all the grocery shopping herself, buying broken cookies because they were cheaper and returning the berry boxes for a five cent refund. At the reception for her mother-in-law’s funeral, Green served the guests with chipped every-day glasses, not the fine crystal. This made Edward furious, and he smashed a glass before marching out of the room. Stories circulated around Bellows Falls about Green’s stinginess, and she supported her reputation with her behavior. One time she was missing a two cent stamp, thinking she lost it in her carriage during an outing. Late that night she woke up the groom and insisted that he thoroughly search the coach. When that proved unfruitful, she made him return to the hotel where she spent the afternoon and search the lawn, also to no avail. After the man had gone back to sleep, Green woke him up again to say that she found the stamp in her pocket where she had put it. Another time, Green went into a shop and started touching the merchandise with her filthy hands. She admitted to the distressed shopkeeper that she had been pulling old nails out of a piece of burned wood to reuse. She was often criticized for her dowdy appearance and even scrimped on laundry. When Green took her skirts to the cleaners, she insisted they just wash the hems since they were the only part that got dirty. For Green, every decision was based on a monetary consideration. When her son, Ned, hurt his knee jumping onto a sled, Green allegedly dressed them both up in ragged clothing and took him to the free clinic. HOLDING THE PURSE STRINGS Green’s parsimony put her in a position to have an amazing amount of leverage. In 1884, her fortune equaled over $500,000 in cash and more than $26 million in bonds, mortgages and other securities which she held in the vaults of John J. Cisco and Son, a well known Wall Street bank. Edward also had his in assets at Cisco, although Green insisted that they keep their fortunes separate. Railroad bonds took a dive and some of Cisco and Son’s biggest investors defaulted, including Mr. Cisco and Edward Green. Cisco continued to give Edward credit for investments because Edward intimated to the bank that he could use his wife’s money as collateral. All he accomplished was to increase his debt, and Edward became Cisco’s biggest debtor while Green was their biggest depositor. Green’s refusal to cover her husband’s debt led to the collapse of Cisco and Son. Green tried to move her assets to another bank, but Lewis May, the new assignee to Cisco, engaged her in a standoff that eventually wore here down. She finally agreed to pay over $422,000 to cover Edward’s debts. Then, she took her securities to Chemical National Bank. Every day Green went to work at Chemical National to manage her portfolio, arriving at 7:00 each morning. She brought dry oatmeal for lunch, adding water and heating it on the radiator. She wore a black veil over her hat to obscure her identity as she walked around Wall Street. People said she looked like a witch, and she was nicknamed The Witch of Wall Street. The Cisco debacle was effectively the end of the Green’s marriage, although she and Edward never divorced. Green took the kids and moved from Bellows Falls to Brooklyn, New York and later to Hoboken, New Jersey, renting from month to month to avoid paying property taxes. In Hoboken, the nameplate next to Green’s doorbell read “C. 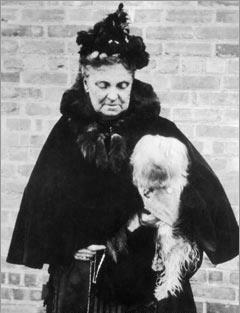 Dewey,” her beloved dog, to maintain her anonymity. Her five-room apartment cost $23 a month. On the mantle Green displayed a bouquet of roses made from dyed chicken feathers because it was cheaper and lasted longer than a bouquet of real ones. Green’s fortune continued to grow, and she became the go-to person for loans. In 1898, the city of New York was broke, so Green loaned the city $1 million at only 2% interest, and another $1.5 million in 1901. Green kept the city afloat again in 1907 by giving $1.1 million in exchange for short-term revenue bonds at 5.5%. In 1900 Tucson, Arizona needed new water and sewer systems, so Green bought the entire $110,000 bond issue. In 1911 Green loaned $325,000 to the Roman Catholic Church of St. Ignatius Loyola at 4.5%. Her children were a big part of Green’s life. Ned was groomed to take over Green’s fortune. He moved to Texas and became the president of Texas Midland Railroad Company. He lived with Mabel Harlow, a former prostitute that he referred to as his “housekeeper.” In 1910 at Green’s request, he dutifully returned to New York, with Mabel, and formed the Westminster Company to directly oversee Green’s fortune. Sylvia was a shy girl, and she stayed by her mother’s side until she met Matthew Astor Wilkes. They were married in secret to avoid publicity, and Wilkes was paid $5,000 to sign a prenuptial agreement giving him no claim to Sylvia’s inheritance. Edward and Green maintained affection for each other. At the end of his life, he moved to be close to her, and she nursed him during his final days. He was 81 years old when he died, and his estate was worth a mere $24,000. QUESTION: How much money do you think you need to be rich? Slack, Charles, Hetty, The Genius And Madness of America’s First Female Tycoon. New York: HarperCollins, 2004.